Developed by guide Mike Mercer of Redding, California. 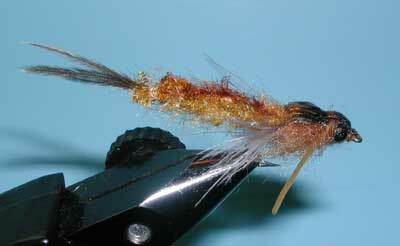 Mike developed this fly based upon a new body material called EZ Bug Yarn by Hugh Beglin and marketed by Metz. The material allowed Mike to develop an extended body that was durable yet soft and sinuous within the water. Mike added Ostrich Herl tips for the tail and secured them with a whip finish that also kept the EZ Bug Yarn from unraveling. Gills, on many hex nymphs, are filoplumes which tend to be small and weak. Mike used natural-gray Marabou and pinch-trimmed the marabou fibers so that they did not extend beyond the length of the abdomen yet provided very enticing movement to the fly. The wingcase are two pieces of mottled turkey with a coating of epoxy. By using two layers of turkey, this ensures that the epoxy will not soak into the thorax. Hex Nymphs being very lively encouraged Mike to also utilize a set of Crazy Legs to the fly just behind the eye. Many hex patterns utilize monofilament eyes, Mike was encouraged by Tim Fox to use Black bead chain eyes to also achieve some weighting to the fly and get some jigging type motion. The last step to Mike's fly is the application of a tan marking pen applied to the top of the thorax to more closely match the natural. The fly should be fished along the bottom with a moderately fast short-strip. Give the fly a jigging action which mimics the naturals action. Hex nymphs can be fished during the day, especially within the Lake Almanor area where they are prolific. During the evening, when they are hatching, allows an opportunity to switch to a dry fly or emerger pattern.